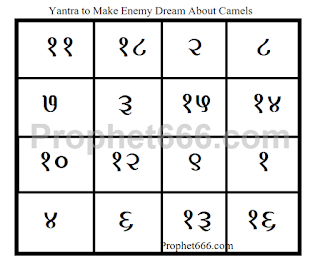 The Yantra, which is shown in the image should be drawn on the bone of camel during the specific period of the Ardra Nakshatra, this Nakshatra is called in the English language as Betelgeuse or Alpha Orionis. The practitioner can draw the Yantra, using any kind of black, blue or red pen. There is no form or worship or any kind of energizing procedure needed for making and using this strange Yantra to harass your enemy by making him suffer from psychological problems. Then, the Yantra has to be buried in the compound of the house of the enemy or hidden inside his home, if he resides in an apartment. As per the Tantra, this Kriya will make the enemy dream about camels all the time in his sleep and create tension and fear in him mind and make him suffer from psychological problems. Notes- This is one of those strange and weird Indian Charms that originated during the Middle-Ages, which were created to harass and enemy who was trying to harm or cause problems for the practitioner. Using this Yantra on any other person, who is not an enemy is not recommended because side-effects are likely. Hence, the practitioner should refrain from using the Yantra against any person who is not bothering him. This is a standalone Yantra Experiment that does not need the chanting of any kind of Infusion Mantra or Prayer.